Are you wanted to improve your self-confidence and want to achieve grand success in your life? If your answer is big ‘YES’, then I urge you to read this book. 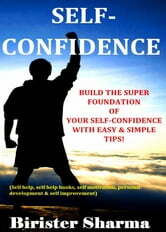 START NOW, and build the super foundation of your self-confidence within you and achieve your cherish goal. * Boast up your low morals. * Wear out your weak points. * Realize you your strengths and calibers. * Help you to re-discover your hidden potential. * Guide you as a true mentor in your success path. Your Best Year Yet! : Make the next 12 months your best ever!